Apple has released the OS X 10.9.1 update for Mac machines via the Mac App Store. The update is available to download for free in the Mac App Store. 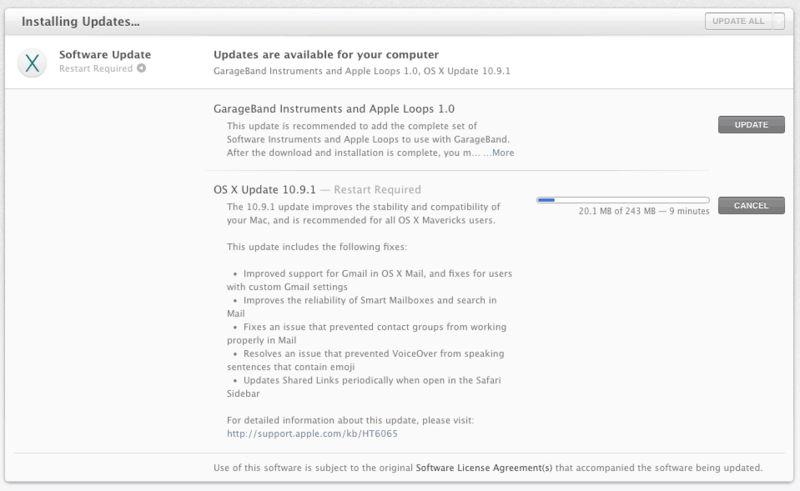 The update carries numerous bug fixes, and improvements to overall performance of OS X 10.9 running machines. The OS X 10.9.1 update brings major fixes for Mail application with improved support for Gmail, and as well as other improvements to sort the emails in the application. The update is also said to fixes the VoiceOver issues that prevented several sentences with emoji characters from being read in the OS X 10.9. The OS X 10.9.1 update is specifically designed for Mail application fix, and focuses only on the Mail application and few other fixes.